The best Las Vegas activities are within minutes of the Las Vegas Strip. 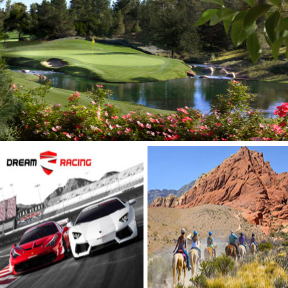 Drive a race car at the Las Vegas Motor Speedway or ride a Zip-line across the desert canyon. Take an ATV tour or experience a tandem skydive. The list of activities below will get your adrenaline pumping and create memories for a lifetime. Racing activities and adventures range from first-class driving experiences to kart racing the entire family will enjoy. Visit the Las Vegas Motor Speedway and for a variety of unique and exciting experiences and events for racing fans, take a Dream Car Tour that puts you behind the wheel of an exotic sports car. Las Vegas ziplines send riders soaring through the air at heights up to 500 feet. Zip line riders experience the thrill of a lifetime while enjoying breathtaking views of Las Vegas and the beautiful desert landscape. Extreme activities and adventures make your Las Vegas trip an event you will remember for a lifetime. Extreme activities range from Jetpacking (like skydiving, jet skiing, parasailing and scuba diving all rolled into one) to ATV tours exploring the Mojave Desert. If you are looking for an adventure, or want to experience some extreme fun, book an exciting Las Vegas tour or one of the Las Vegas extreme activities below. Book a VIP target shooting experience at one of the indoor shooting ranges and enjoy private firing lanes, a private hostess, LCD TVs, and more. Las Vegas skydiving activities and adventures provide an adrenaline thrill like no other! Experience an exciting free fall, followed by a parachute decent while you enjoy amazing views of Las Vegas and the surrounding desert landscape. Not ready to commit to jumping from a plane? Las Vegas indoor skydiving will give you the experience of flying without the fear of jumping from a plane and falling through the sky.